Are you ready for our 10th Annual Restaurant Stroll? An evening with friends, new and old, to stroll the Union Landing to sample foods from the local restaurants. Come Join the Fun for our Annual Restaurant Stroll. 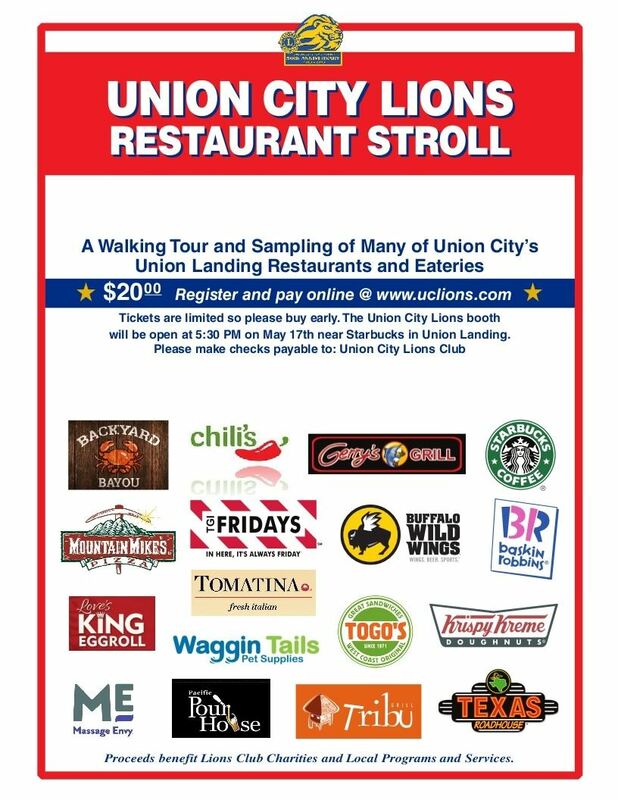 For only $20 you can sample most of the Eateries and Restaurants located in the Union Landing Complex in Union City CA. See below for a list of restaurants and eateries participating in 2018. Tickets are limited to 300! Don't delay by your tickets today. The Flyer below is from our extremely successful and fun 2018 Restaurant Stroll! We are currently working on our 2019 participants and as soon as we have confirmed all participants we will update the flyer. The flyer below is intended to be an example only. PLEASE IGNORE THE DATE ON THE 2018 FLYER.